Concerns About Future of Ag Trade Driving Sentiment Lower? 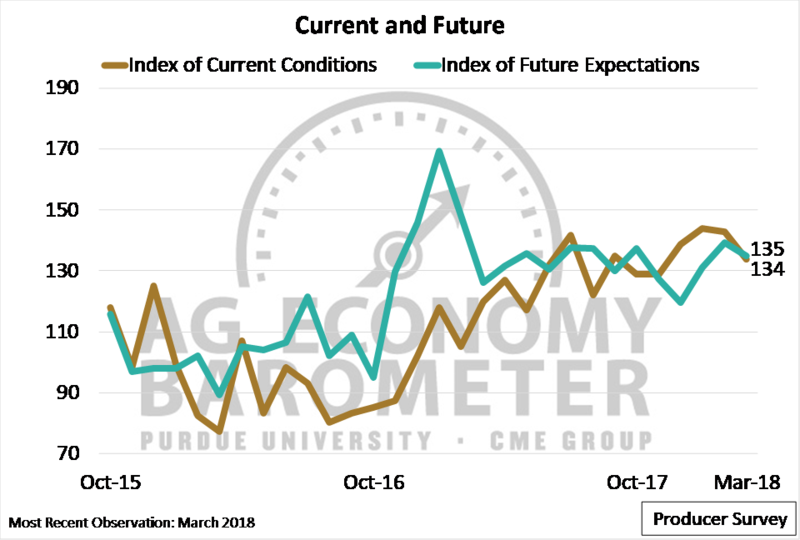 The Purdue/CME Group Ag Economy Barometer slipped to 135 in March, down 5 points compared to February, but unchanged from January’s results (Figure 1). The decline in the sentiment index, which is based upon a monthly a survey of 400 agricultural producers from across the U.S, was attributable to ag producers’ weakening perceptions of current conditions and a decline in their expectations for the future. The Index of Current Conditions fell to 134 in March, a 9-point drop from February, and the Index of Future Expectations slipped to 135, down 4 points compared to a month earlier (Figure 2). Despite the decline in March, the barometer’s first quarter average was unchanged from 2017’s first quarter and was nearly 50 percent higher than during the first quarter of 2016. Figure 1. 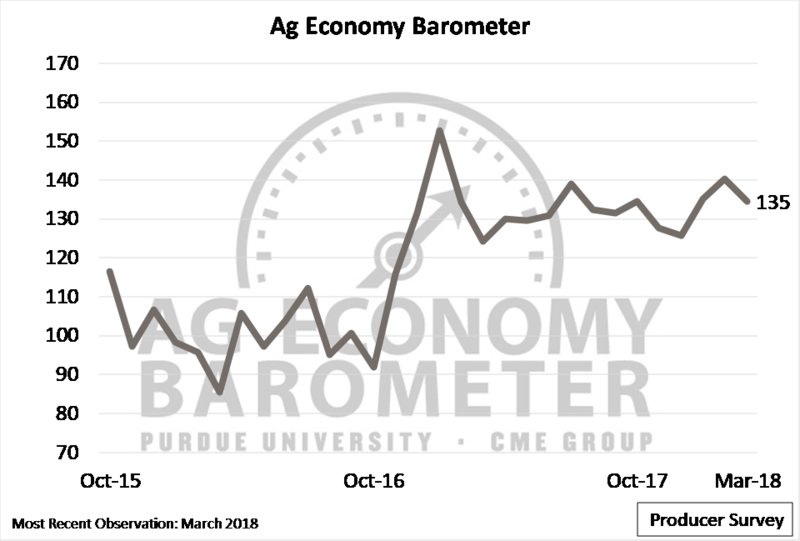 Purdue/CME Group Ag Economy Barometer, October 2015-March 2018. Figure 2. Index of Current Conditions and Index of Future Expectations, October 2015-March 2018. The March survey suggests there is an undercurrent of concern among producers regarding the ag economy. Each month, producers are asked if they think now is a good time or bad time to make large investments in assets, such as machinery or buildings. In March, fewer producers indicated now is a good time, and more producers said it is a bad time, to make large farm investments than one month earlier (Figure 3). Interestingly, the percentage of producers indicating now is a bad time to make large investments – 68 percent – is the highest level observed since May 2017. Figure 3. 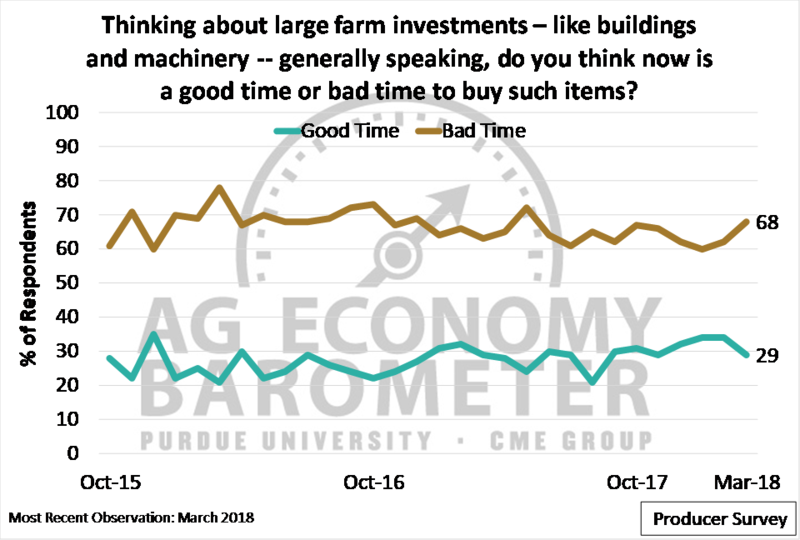 Percentage of producers who think now is a good time and bad time to make large farm investments, October 2015-March 2018. Previous surveys have posed various questions to producers regarding the importance of agricultural trade and NAFTA. Respondents to those surveys indicated trade was important to both the ag economy and to their farms. They also expressed a willingness to renegotiate NAFTA with the expectation that renegotiations would prove favorable to U.S. agriculture. Two questions were included on the March 2018 survey to learn more about producers’ perspectives on agricultural trade, especially in light of the Trump administration’s announcements regarding tariffs on steel and aluminum. Specifically, we asked producers the likelihood that a trade war would significantly reduce U.S. agriculture’s exports (Figure 4). One-fourth of survey respondents provided a neutral rating (a rating of 5 on a 1 to 9 scale), suggesting much uncertainty among producers regarding a possible trade war and its impact on agriculture. 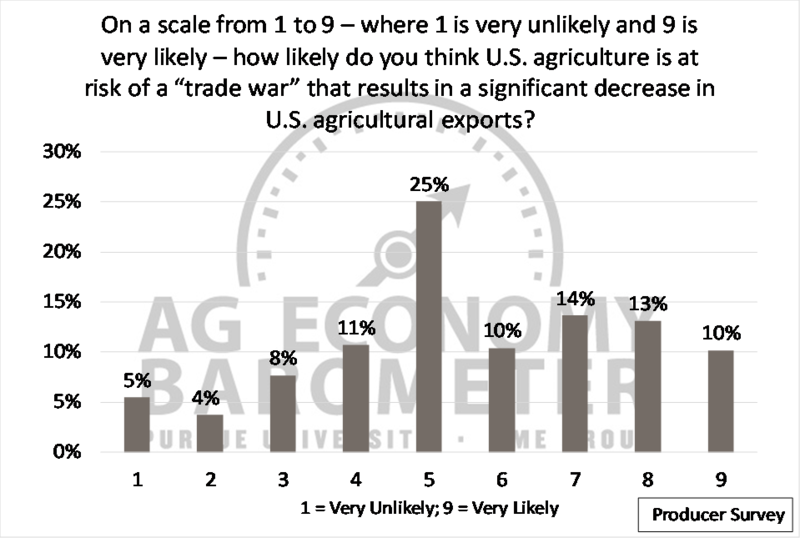 However, nearly half of survey respondents (47 percent) indicated that a trade war negatively impacting ag exports was somewhat likely (a rating of 6 or higher on a 1 to 9 scale). This compared to just 28 percent of survey respondents who indicated a trade war negatively impacting agricultural trade was unlikely (a rating of 4 or less on a 1 to 9 scale). In the midst of ongoing negotiations between the U.S. and both Canada and Mexico regarding NAFTA, we also asked producers about the likelihood the U.S. would withdraw from NAFTA. 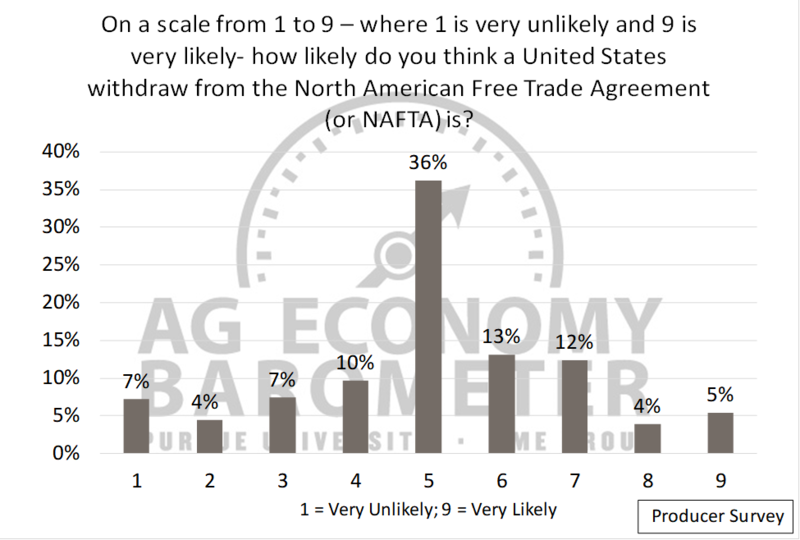 Once again, producers expressed much uncertainty, as more than one-third of respondents provided a neutral response (rating of 5 on a 1 to 9 scale), suggesting they think the likelihood of staying in and withdrawing from NAFTA are about equal (Figure 5). Remaining responses were split between producers expecting the U.S. to remain in NAFTA (28 percent with a score of 4 or less) and those expecting the U.S. to exit NAFTA (34 percent with a score of 6 or higher). Interestingly, when comparing results from the two trade questions, a larger share of respondents (47 percent) reported a significant decline in ag exports from a trade war was more likely than was the likelihood of the U.S. withdrawing from NAFTA (34 percent). These results are important for two reasons. First, nearly half of producers rated the risk of a trade war as at least somewhat likely. Second, producers’ concerns about risks to agricultural trade are broader than just the ongoing NAFTA situation. Taken a step further, these results indicate there is a good deal of uneasiness among producers regarding ag trade prospects, which in turn could be one reason behind the recent downturn in the percentage of producers indicating now is a good time to make large investments on their farms. Figure 4. Producers’ rating of how likely U.S. agriculture is at risk of a “trade war” that results in a significant decrease in U.S. agricultural exports, March 2018. Figure 5. Producers’ rating the likelihood of a U.S. withdraw from NAFTA, March 2018. Producer sentiment drifted lower in March as both the Index of Current Conditions and the Index of Future Expectations declined. Although sentiment in March was lower than in February, it’s worth noting that sentiment during the first quarter of 2018 was, on average, equal to that observed during the first quarter of 2017. Perhaps more importantly, sentiment in early 2018 remains much more positive than it was during most of 2016. The dip in ag producer sentiment noted in the March survey comes on the heels of the U.S. announcing plans to levy tariffs on imported steel and aluminum and amid press reports of other countries considering imposition of tariffs on U.S. exports, including ag products. From the March survey results, it’s clear that a large portion of producers are concerned about the possibility of a trade war erupting that could negatively impact ag exports. Concerns about ag exports could be one reason why fewer producers said now is a good time to make large farm investments in assets such as machinery and buildings.